What is better during the holidays than pie? I am not sure if I can find a single thing. Maybe Pie a la mode? Or …. nope nothing. As a kid my mother would get apple pie from the grocery sometimes only a half of pie for dessert and place it in the produce drawer of the fridge. I am sure she knew it never made it to dinner because my greedy belly would go in there, sneak it out, and sit on our tile floor gobbling up every inch of it after lunch. These days I know better. Mostly because I don’t want adult onset diabetes but also because I would have a terrible stomach ache and headache from all its delicious sugar. 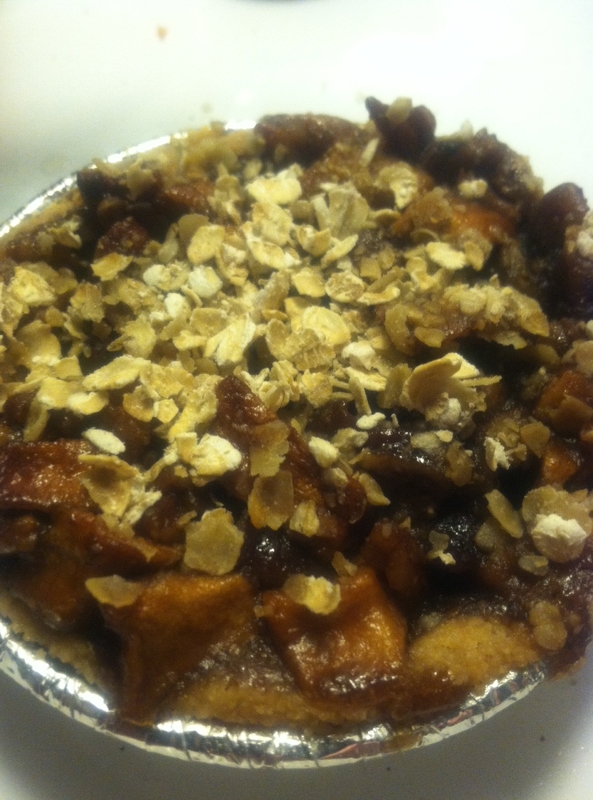 Well with the ideas of a warm holiday pie dancing through my stomach and moderation in the back of my head…. here is my delicious Caramel Apple Pie Recipe. Enjoy loves! Peel and dice all the apples. In a medium sauce pan place 1 peeled diced apple, sugar, butter, flour, egg replacer, and water over medium low heat. Stir until combined watching carefully as sugar burns easily. It will turn a rich brown color. Add 3/4 of the nuts you have chosen. Reserve the other 1/4 to sprinkle on top of pies. Place a portion of the remaining apples in each pie crust evenly at about 2 apples per pie. I use a apple peeler/corer and then sliced and quartered them. It reduces the time substantially. Next, pour at least 2 tablespoons of mixture over each of the 6 pies until covered and full. 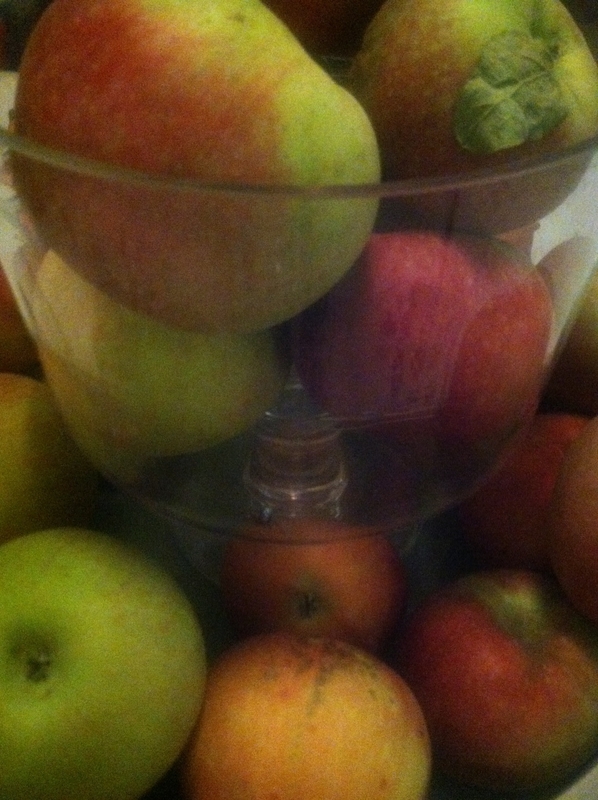 The apples should be stacked in a dome above the crust. They will sink as they cook down. Sprinkle tops of the pies lightly with remaining nuts and some quick oats. You may not use all the oats and this is fine. Place pies on cookie sheet. Bake at 350 degrees until bubbling and brown (around 15minutes). Cool for 10-15minutes. Serve warm. Feel free to make this with a mini scoop of my vegan vanilla ice cream (earlier super simple recipe) or the coconut whipped cream (also another earlier simple recipe) dolloped on top! It is so delicious and decadent I promise it will be a huge hit! The other day when I was testing it I sent my omnivore male friend from college home with 3 mini pies and he was so happy he would text me as he ate them. Bachelors love take home treats! I was suprised he wasn’t all appled out after eating 5-7 apples while we went apple picking! I guess you can never have too much of a good thing.